Pianist Mike Strickland is known for his unmatched ability to connect with his audience. He brings a blend of musicianship, showmanship and artistry to the concert stage with his unique arrangements of pop, jazz, blues, boogie, and original music. 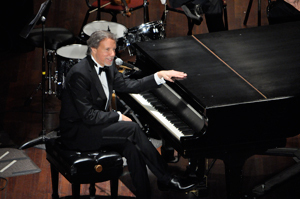 In addition to his popular Solo Piano Concerts, he also tours with his daughter presenting a father/daughter duo piano show called Classical Meets “Pop”. Mike also tours with The Mike Strickland Duo featuring world-class bassist, Clipper Anderson. Mike is also known for his phenomenal outreach programs and mentoring skills. He loves to inspire local young musicians whether giving a school concert or mentoring the up-and-coming vocalists and instrumentalists, often featuring them in his concerts. “In the last six years, Mike has appeared twice for Redmond (Oregon) Community Concert Association (RCCA), and he is without a doubt the most talked about and unforgettable artist RCCA has presented in my 10 years on the board. In a nutshell, when Mike performs everyone in the audience feels he is playing just for them. Super personable fellow who truly connects with the audience.” – J.J.